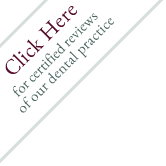 We care about our patients and do our utmost to provide the services that help keep them safe, healthy and comfortable, and provide the restorations that are extremely durable. The advanced technology that we employ in our office allows us to do just that. Please click on the links below to read further information about the technology used in our dental office.